My name is Beamer. My parents gave me that name because of my beautiful smile. 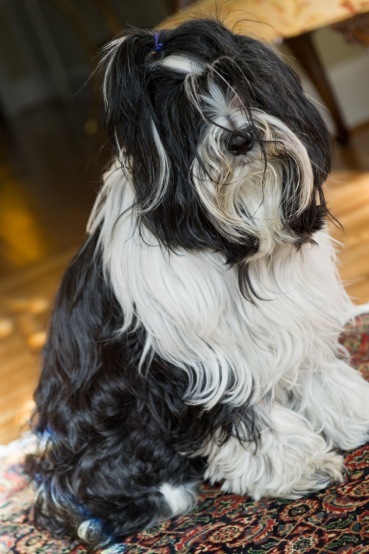 I am a ten year old Tibetan Terrier (often called TT by those in the know) that lives in Atlanta, Georgia. My blood lines are centuries old and can be traced to the mountains of Tibet and Tibetan monks. I am a devoted family man that is protective of mom and dad and my bed. I have been a healthy TT, with the exception of some digestive problems usually brought on by separation anxiety. You see, mom and dad travel and they sometimes leave me at home with the sitter. When the suitcases come out I get nervous. I get very nervous. At 2 am on January 20, 2012 I asked dad let me out to complete some unfinished business. I encountered a foe in my fenced yard. An obvious bandit as he was wearing a mask. I took action. The ensuing fight was loud and dad came running to my aid. You see, he’s protective too. The masked cat, I think the police report said his name was raccoon, had me by my hair and when dad showed up, well the bandit was smokin’ out of there. Unfortunately, I was injured. He tore my lip and I had to go to the hospital to have stitches. I don’t like going to the hospital, ever. I get a nervous disorder. Humans call it white coat syndrome. I call it fear. I was given a rabies booster later that same day. Nineteen days later my back legs went limp and I couldn’t walk. After many tests they have decided I have Coonhound Paralysis. They believe it was caused by the rabies vaccine. This has led to more doctor’s visits (white coat terror), physical therapy (I am not a pin cushion), holistic food (barf) and a lot of home pampering (which I richly deserve). Mom started this website to keep everyone informed about my progress in dealing with this disease. She said that other TT’s , dogs and even people could catch this disease, but not from me, so it is important to help everyone understand our situation. I hope you will read and leave comments. Until next time . .. Woof. Best wishes for a speedy recovery, Beamer. Tell Mom and Dad that my heart goes out to them. Day by day is all we can do. And you get better, you hear! Beamer, my heart goes out to you. You sound like a most wonderful boy, and I wish you all the very best. We will say a prayer for you. Be well, Beamer. Your mom and dad certainly adore you! Hi! Would you be willing to give me a call? My dog just had the same surgery, at the same hospital. I would feel very relieved and grateful to speak with you. Please email me at amypearson7507@gmail.com to connect! Thank you in advance! Hi Amy, I tried to send an email, but it was returned. You can reach me at gwenpratesi@hotmail.com. Thank you so much for sharing Beamers story. It helped us so much on our journey with our beloved Cayta. She had most of her lower jaw removed in July 2018. She has adapted so well and continues to spread her love (and slobber) to everyone.